Change and adjustments have not been unfamiliar to the Jackson State football program. In fact, both are necessary for the consistent growth on a team. For JSU, adjustments are still being made through its spring practice to ensure that the team is in the best possible position to be successful when the 2019 season rolls around – one that will be here in less than five months. Until then, Jackson State head coach John Hendrick and his staff have been hard at work over the last three weeks, making sure that players understand the basics, techniques and their expectations moving into a new season. 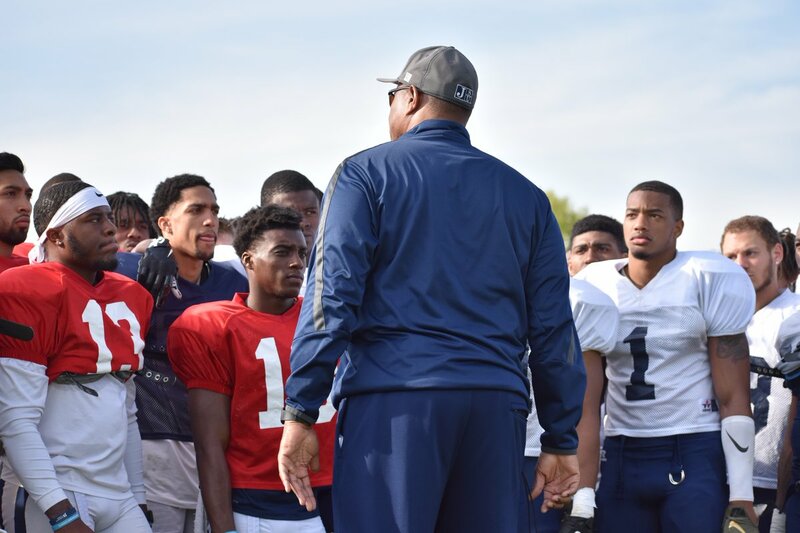 In its third week of spring practice, JSU held its first scrimmage last week before returning to practice Tuesday afternoon. From that scrimmage, the offensive side of the ball stepped up and made some plays while the defense struggled in situations. For Hendrick, however, the overarching goal for the team at the moment is to continuing to improve each day. “We’ve got a lot of young guys playing who are getting repetition,” Hendrick said. Preaching the concept of consistent energy, the Tuesday afternoon practice saw lots of effort and tussles between players competing at high levels, something Hendrick really likes to see in his players. “When they got excited and started going after each other, I like that,” Hendrick said. Considering that, here are a few takeaways through three weeks of spring practice. 1. Quarterback competition remains a close one. The competition at the quarterback position still remains a big focus through practice. As all of them continue to make progress, the scrimmage on Saturday should further help to see which player is standing out the most. Following Saturday’s scrimmage, the spring game will be the next benchmark to see which quarterback – Jack Strouse, Derrick Ponder and Matt Little – stands out among the group. 2. Defense looks strong consistently for the most part. The defense struggled in last week’s scrimmage in practice. In Tuesday’s practice, however, the defense redeemed itself, making some solid plays to slow down the offense. Hendrick said the offense became complacent after its performance from the last scrimmage. “I told them sometimes you do really good and you get a little complacent because you take things for granted,” Hendrick said. Defensively, keep an eye on Keonte Hampton as an emerging playmaker for the Tigers on defense at the linebacker position. Hampton, a redshirt sophomore, finished his freshman campaign as an FCS Hero Sports All-American Team, recording 80 tackles with 40 being solo. The West Point, Mississippi native tallied 10.5 tackles for a loss, 1.5 sacks and averaged 8.3 tackles per game (ranked fifth in the Southwestern Athletic Conference. While Hampton knows his level of contribution to the team, he knows that this season will be a little different for him in finding his voice of becoming a leader for the Tigers defensively. “Coach Hendrick just told me to work on becoming more vocal and I have to work on that,” Hampton said. 3. Younger players are beginning to understand the style of play and showcasing their ability to make plays. With each practice, because of the injuries on both sides of the ball, younger players at skilled positions are getting more reps in practice. As a result, players are getting more comfortable in the offensive and defensive schemes. “When your first line guys get hurt, it gives your second line guys an opportunity to stand up and stand out,” Hendrick said. 4. The Tigers’ stable of running backs looks extremely solid. As if the Tigers did not have a solid group of running backs last season, the 2019 campaign will showcase another full slate of talent at the running back position. Running backs Jordan Johnson, Keshawn Harper, Matthew Harvey, Deandre Williams, Josh Little and Quitten Brown all return from a year ago. Then, adding Gregory Williams – who signed with JSU during the early signing period – brings another dynamic back to the rushing attack. Williams, who originally signed with the University of Memphis out of high school, was a former running back from White Station High School from 2015-17, Williams finished 2017 among the top-10 leading rushers in Shelby County. Not to mention, the Memphis, Tenn., native was a Tennessee Sports Writer Association 6A All-State Athlete, All-Region 8-6A first team and The Commercial Appeal Best of Preps All-Metro. 5. Energy and effort are the ultimate standards for the Tigers every day in practice. Spring practice is the time where coaches are coaching, fixing and correcting players’ technique, different plays and seeing which players stand out among the rest. Beyond that, however, Hendrick constantly stresses three main words to his players: effort, enthusiasm and focus. “If we get that everyday, I can’t be sad about practice,” Hendrick said. Following the final week of spring practice next week, Jackson State will host its spring annual spring game at 6 p.m. on Saturday, April 13 at Mississippi Veterans Memorial Stadium.